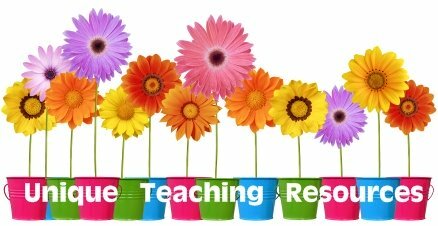 Welcome to my spring English teaching resources page. 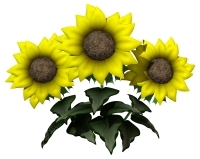 On this page, you will find a variety of reading and creative writing activities to use for April, May, and springtime. 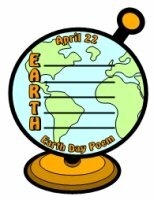 This page contains examples of unique spring writing templates, reading sticker charts, poetry, and English powerpoint presentations. April and May are the perfect time of the year to have your students SPRING into reading! 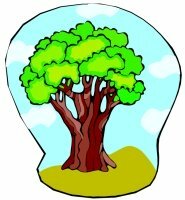 My students are encouraged to read during the months of April and May with unique reading sticker charts that are designed specifically for spring. During April and May provide your students with creative writing activities that will make them spring into action! I hope that you find some refreshing and new ideas to use with your own students during the months of April and May with these spring English teaching resources. 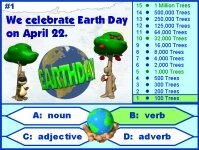 school year, I have always used these unique teaching resources during the spring. spring bulletin board display that everyone will notice! 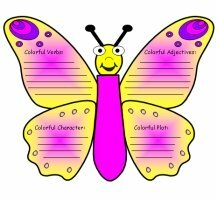 For this first butterfly book report project, students find examples of colorful elements in their stories: colorful verbs, colorful adjectives, colorful characters, and colorful plot. The colorful caterpillar book report below matches this butterfly book report. 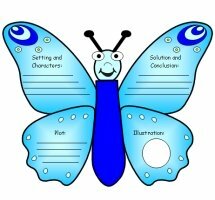 For this second butterfly book report project, students write about the main elements of their books: setting, characters, plot, solution, conclusion, and illustration. 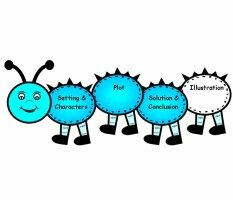 The story elements caterpillar book report below matches this butterfly book report. 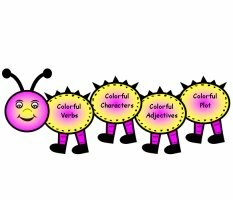 For this first caterpillar book report project, students find examples of colorful elements in their stories: colorful verbs, colorful adjectives, colorful characters, and colorful plot. 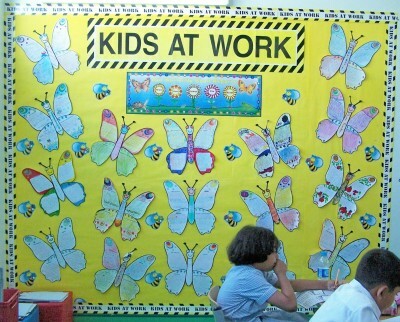 The colorful butterfly book report above matches this caterpillar book report. For this second caterpillar book report project, students write about the main elements of their books: setting, characters, plot, solution, conclusion, and illustration. 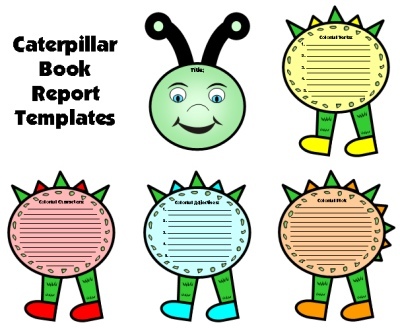 The story elements butterfly book report above matches this caterpillar book report. 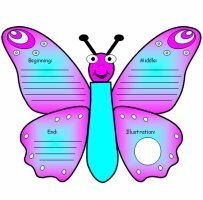 Above: This banner is included in the Butterfly Writing Templates set found below. Above: This banner is included in the Caterpillar Writing Templates set found below. This 5 page bulletin board banner is included in this set of spring English teaching resources. Teresa's It's Raining Books bulletin board display. Teresa teaches Grade 4 in New Jersey. "It's Raining Books!" is a colorful sticker chart set that will help you to motivate your students to read during the spring. Although I have included this teaching resource on my spring page, this reading sticker chart set can easily be used anytime during the school year. 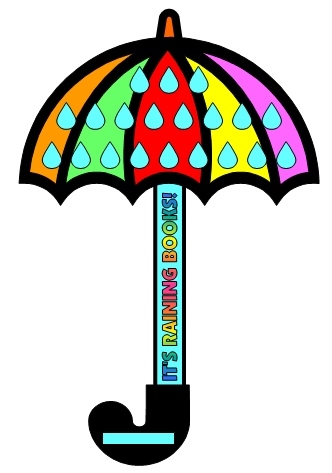 There are two templates to cut out and glue together for this sticker chart set: the top umbrella section and the handle. The umbrella sticker chart measures 10 inches in width and 15 inches in height when it is assembled. The stickers are placed inside the raindrops on the umbrella, and these raindrops are numbered 1 - 20 (you can't see the numbers in the example below, but they are slightly visible in the other examples that follow.) 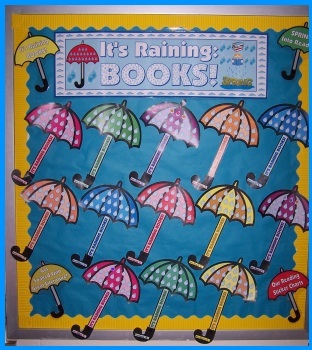 Students write their names in the handle and the umbrella's stick says: "It's Raining Books!" 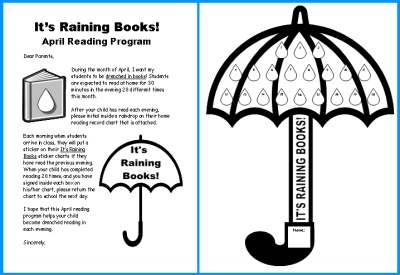 You can cut out these reading sticker charts along the thick black lines to have unique umbrella shaped reading sticker charts. Below are the black and white umbrella sticker chart templates. There are two handles on each page to save paper when printing these pages. There are 9 different colors of umbrella templates for you to choose from. 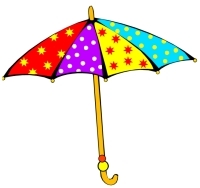 The first 2 umbrella templates are rainbow colors (shown below). red, orange, green, yellow, pink, purple, and blue. 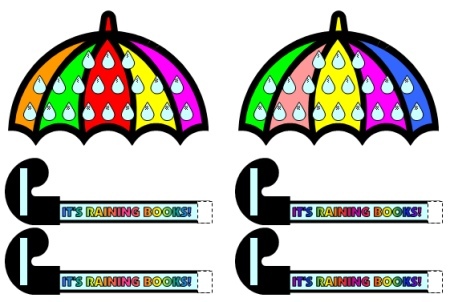 Above are examples of the red, green, and pink umbrella sticker chart templates. 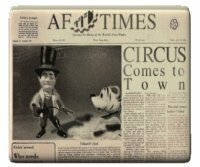 This set includes a It's Raining Books! 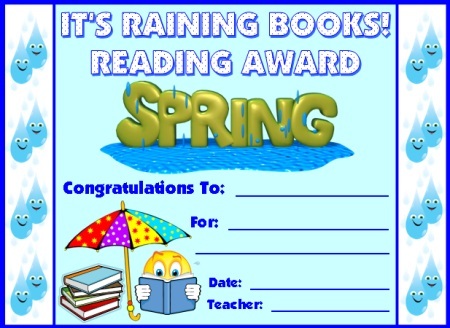 Reading Award certificate that you can present to your students when they have completed their sticker charts. A black and white copy of this award certificate is also included in this teaching resources set. Below is a letter that you can send home to parents that explains this home reading program, along with the printable worksheet for parents to sign each time their child reads at home. This parent letter is in the form of a Microsoft Word document so that you can edit it to your own word choice. The title in the letter currently says April Reading Program, but you can easily change that using this Microsoft Word document. Below: This set of spring English teaching resources includes 8 color umbrellas to use as bulletin board accent pieces to help you create your eye-catching spring bulletin board display. Each Vocabulary Word You Learn is a DROP of New Knowledge! 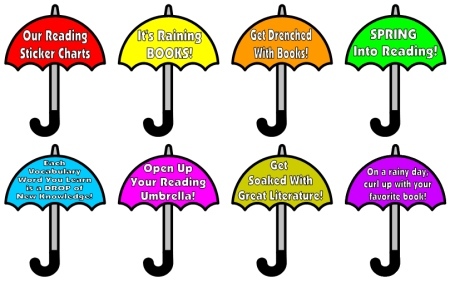 Open Up Your Reading Umbrella! Get Soaked With Great Literature! On a Rainy Day, Curl Up With Your Favorite Book! Teresa's Reading Rainbow bulletin board display. This Reading Rainbow sticker chart set will help you to motivate your students to read during the spring. Although I have included this resource on my spring English teaching resources page, this sticker chart can be used anytime of the school year. 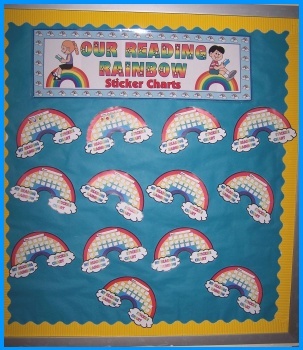 This rainbow sticker chart measures 10 inches in width and 6 inches in height. There are 25 sticker boxes on this rainbow shaped incentive chart. 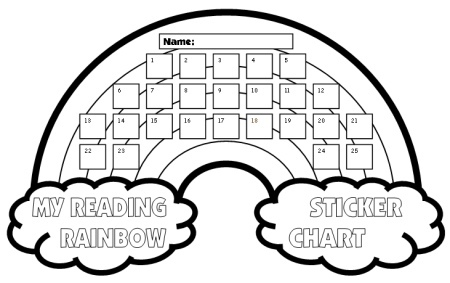 black lines to have unique rainbow shaped reading sticker charts. 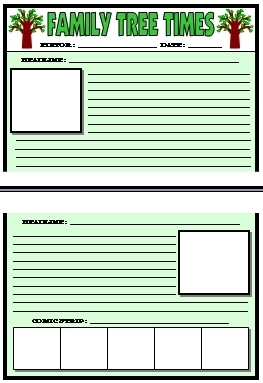 Below is an example of the black and white sticker chart template. Below is an example of the color sticker chart template. 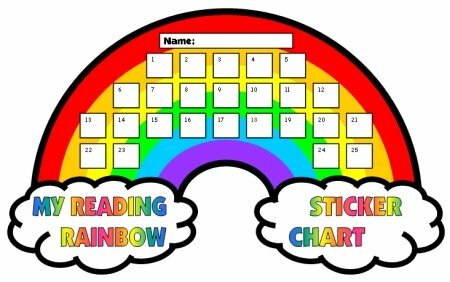 This sticker chart set includes a Reading Rainbow Student Award certificate that you can present to your students when they have completed their sticker charts. There is a different award to give to boy and girl students. A black and white copy of this award certificate is also included in this set of teaching resources. The title in the letter currently says May Reading Program, but you can easily change that in this Microsoft Word document. This reading sticker chart could be used anytime of the school year. This set of spring English teaching resources includes 6 color rainbows to use as bulletin board accent pieces to help you create your eye-catching spring bulletin board display. Meet Colorful Characters By Reading Books! Learn a Colorful Vocabulary By Reading Books! Travel to Colorful Places By Reading Books! Go On Colorful Adventures By Reading Books! First, this is a S.P.R.I.N.G. acrostic poem. I have added a challenge to the concept of a typical acrostic poem though, because the key letters appear in the middle of the poem, instead of at the beginning of the poem. 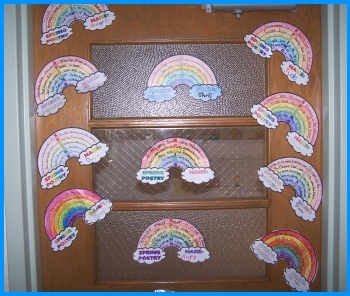 Second, this a rainbow shape poem and students complete their final drafts by writing in the arch shape of a rainbow. Students cut out the rainbow templates along the thick black border and then they have unique rainbow shaped poetry writing templates. The finished drafts of these S.P.R.I.N.G. 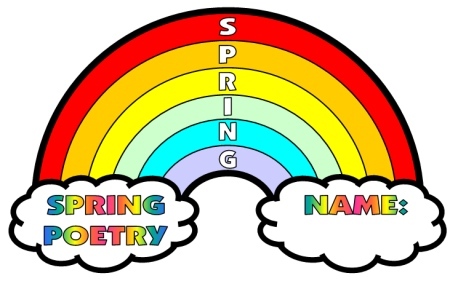 acrostic rainbow poems will make a very colorful poetry bulletin board display in your classroom. Everything that you need to complete these spring acrostic poems is included in this poetry set. All that you will need is scissors and coloring pencils. For creative writing assignments, I believe that it is important for students to go through the steps of the writing process. For this reason, my students never begin writing their poems on their final draft rainbow poetry templates, instead they write on first draft worksheets. Then, they edit and revise their poems on their own, with a partner, or in individual writing conferences with me. 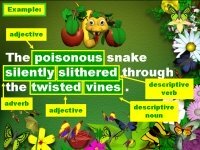 is included in this spring English teaching resources set. 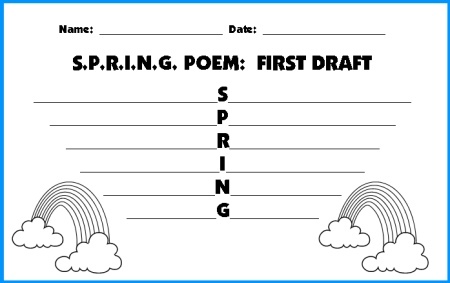 After students have edited and revised the first drafts of their spring poems, you should give them their final draft rainbow templates. 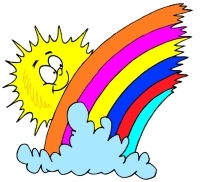 The rainbow poetry templates measure 6 inches in height and 10 inches in width. 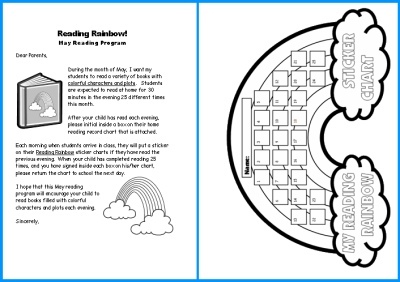 These rainbow templates have thick border lines, so it is easy for the students to cut out their rainbow acrostic poem templates themselves. Students write their acrostic poems on the 6 arched lines on the rainbow templates, and each line of the poem gets shorter in length. 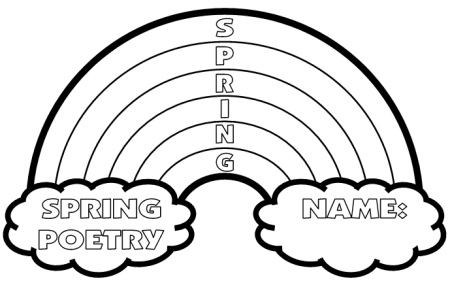 Below is an example of the black and white rainbow poem templates. 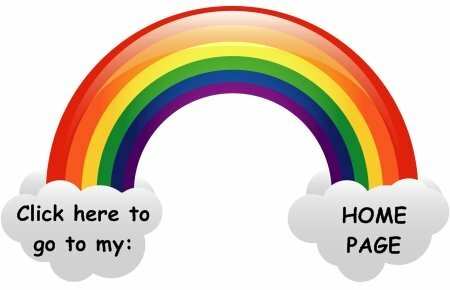 Below is an example of the color rainbow poem templates. For final draft poetry assignments, when I give my students fun templates to write on, I have found that they tend to use their best effort, and they are more careful to not make careless spelling, grammar, and punctuation errors. 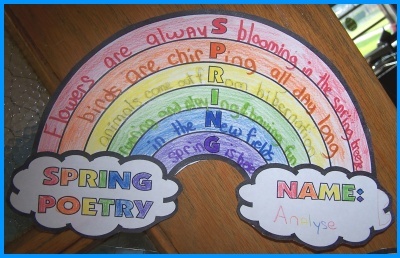 Below is an example of student's finished spring rainbow poem. This set of spring English teaching resources includes 6 color rainbows to use as bulletin board accent pieces to help you create your eye-catching spring poetry bulletin board display. We are Colorful Poets! / We are Colourful Poets! These poetry lesson plans will have your students' poetry flying high in the air! Students write a shape poem where each line of their poem is shorter in length than the previous line. 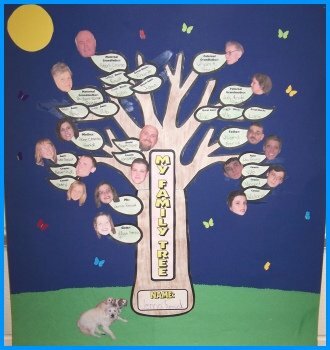 Are you looking for a unique idea and way for your students to create their own family trees? Have you used traditional one page worksheets for this activity in the past? 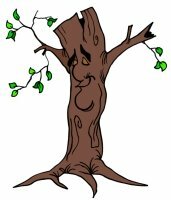 I have created a Family Tree teaching resources set that will have your students excited and branching out to learn about the members in their own family trees. In order to assemble the tree, there are two branch templates and a trunk template that are glued together to form a family tree that measures 18 inches in height and 13 inches in width. 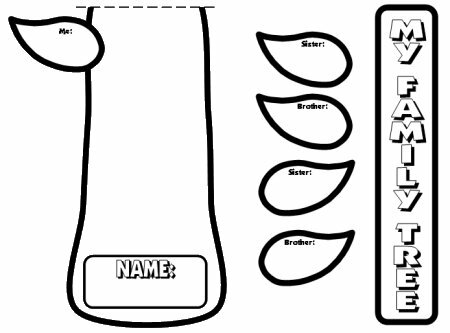 Explain to your students that each family is different and their "planning worksheet" (shown below) is meant to help them plan their family tree. Students may have to add additional boxes if there are more members in certain sections of their family tree. 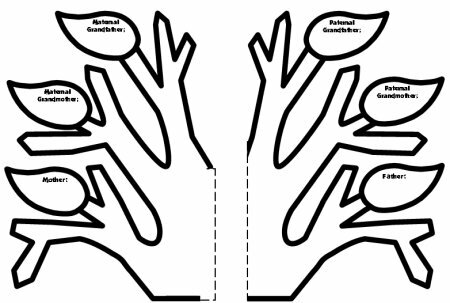 If you want to go farther back in the family tree for your students' projects (great grandparents, great cousins, etc), there are blank leaves so that you can add this component to your students' projects. Below is an example of the family tree planning worksheet. 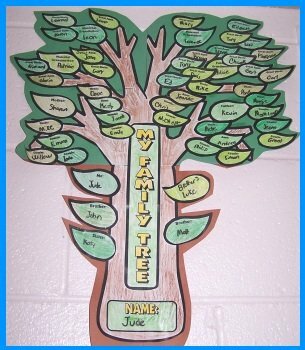 These Family Tree projects include two branch templates and one trunk template. When these 3 templates are assembled together, the Family Tree measures 18 inches in height and 13 inches in width. the left side is for the mother's family and the right side is for the father's family. There are 6 branches for the key family members: mother, maternal grandmother, maternal grandfather, father, paternal grandmother, and paternal grandfather. The student leaf is already on the trunk and students should glue leaves for their brothers and sisters in this same trunk area. After the three pieces of the tree have been assembled, students glue the vertical title "My Family Tree" in the middle of the tree. The smaller leaves (see below) are for the more distant members of their family tree: aunts, uncles, cousins, great uncles, and great aunts. You will need to print out extra worksheets of the leaves because some students will need more leaves for their brothers, sisters, aunts, uncles, cousins, great uncles, and great aunts. 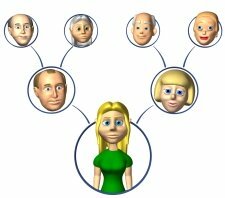 Below I have provided a large visual example of how this family tree project works to illustrate the members of a person's family. This is an example of the mother's branch. The mother's leaf is already on this left branch. Directly opposite (not shown), on the right hand branch, is the father's leaf. 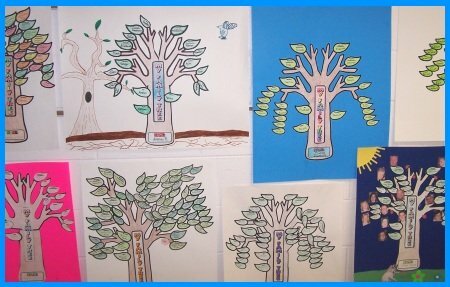 Students write the names of each family member inside each leaf. For this example, the mother has one brother and one sister, and these family members are the student's uncle and aunt. The student glues an aunt and uncle leaf onto the mother's branch. The uncle has one child, so one cousin leaf is glued in this place. The aunt has two children, so two cousin leaves are glued in this place. The cousin leaves should be glued so that they are touching their parent's leaf. 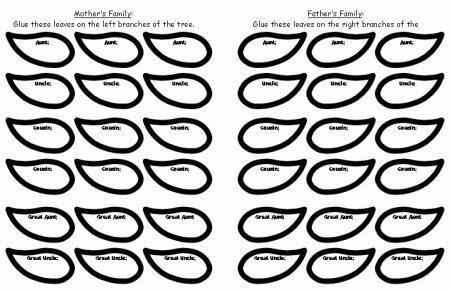 If you use this format in gluing the leaves on the tree, a student may have a branch that only has their mother's leaf on it, if their mother has no brothers or sisters. On the other hand, the father's branch might be very full if he has 6 brothers and sisters, and they have a lot of children. 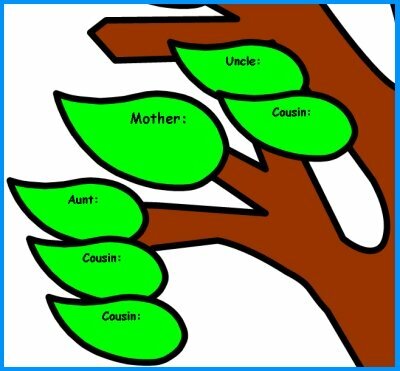 In the example below, this student has 16 leaves/family members on her mother's side of the family and 20 leaves/family members on her father's side of the family. 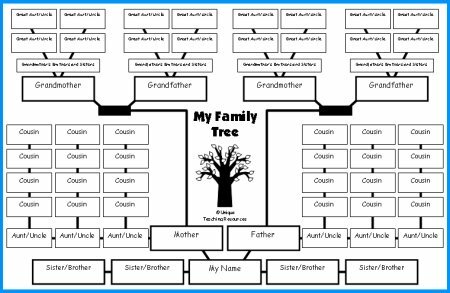 There is a set of Family Tree color templates (shown below) for you to use for your example that you share with your students provided in this set of Family Tree teaching resources. It is a bit time consuming to color all the branch and leaf templates. I hope that these color printable worksheets help save you time in designing your own example that you display for your students so that they understand how to complete these fun Family Tree projects. 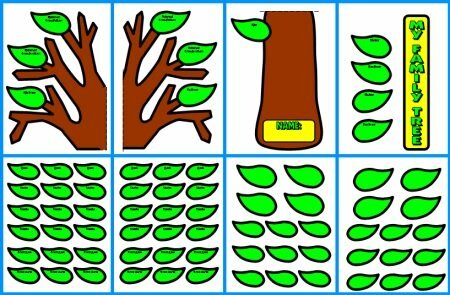 I have provided blank branch, trunk and leaf templates in this set of teaching resources so that you can have your students design this project in any way in which you choose. 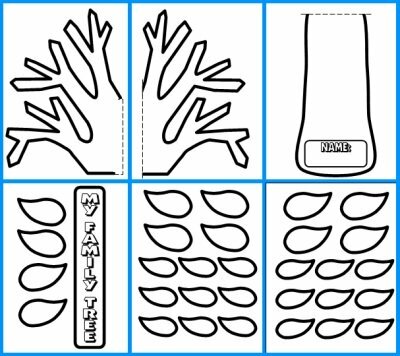 In this set of templates, the names of the family members are not written on any of the leaves and the 6 closest family members' leaves are not already included on the branches. 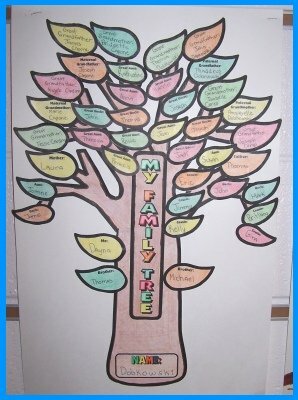 This Family Tree set of teaching resources works well in conjunction with a social studies unit. While students are studying a particular event in history, they could be discovering about their own roots and creating their own family tree. This assignment works well as a week long homework activity for students to complete at home with the help of their parents. Parents will enjoy working on this very different type of homework assignment with their child and sharing information with their son or daughter about the members of their own family. 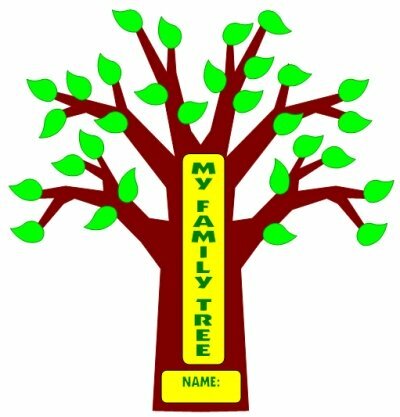 You will be amazed at your students' finished Family Tree projects and the creative ideas that they incorporate into their individual projects. Below: This student has included photographs of her family members on her family tree project. I love that she has included photographs of her dogs laying in the grass and that she considers her dogs as important members of her family. I try to always include a creative writing component to any assignment when I get the chance. My students need all the writing practice that I can squeeze into my lessons. While my students are finding out the names of the members of their family tree from their mothers and fathers, I have my students ask each of their parents to share something interesting about one member of their family they may never have heard about before. Then, my students create a newspaper and it contains two articles. One article is about a member from their mother's side of their family tree, and the other article is about a member from their father's side of the family. 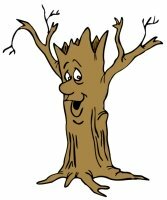 I have included all of the components of this Family Tree Newspaper in this set of Family Tree teaching resources. 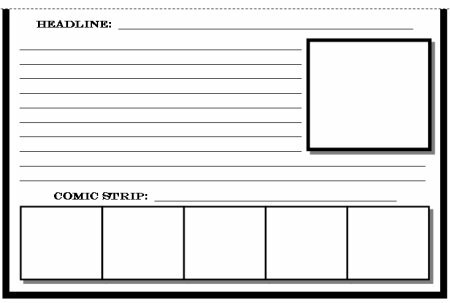 directions printable worksheet and a grading rubric. set includes three first draft worksheets. 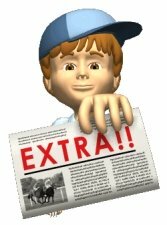 Students write two newspaper articles about someone on their mother's side of their family and then on their father's side of their family. Students also have to create a comic strip for their newspapers about something interesting that happened to someone who is in their family tree. 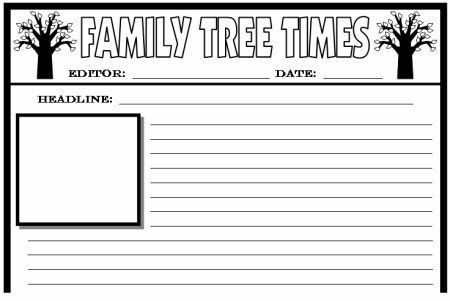 For the final drafts of their newpaper projects, students have two templates that are glued together to form a large Family Tree Times Newspaper. After the templates have been assembled together, the student newspaper project measures 13 inches in height and 10 inches in width. for you to use for your example that you show to your students. classroom display of these newspaper projects. school year, I have always used these powerpoint lesson plans during the spring. Each of the boxes below contains a short description and a small picture of each of my spring powerpoint lesson plans. If you click on the underlined link at the bottom of each box, you will be taken to my spring powerpoint lesson plans page that describes that powerpoint teaching resource in more detail. This new page will show you larger pictures of the different powerpoint slides that are included in each set of teaching resources. This new page also contains free samples of the powerpoint lessons for you to download and view. 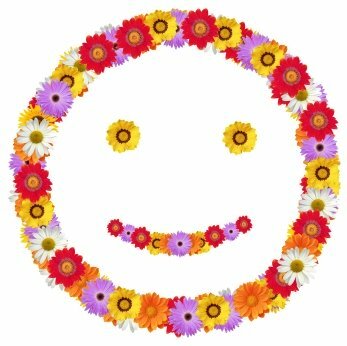 Thank you for visiting my Spring English Teaching Resources page.